Howdy! I am delighted to present to you Nick Galifianakis's cover for Magic Bullet #9. 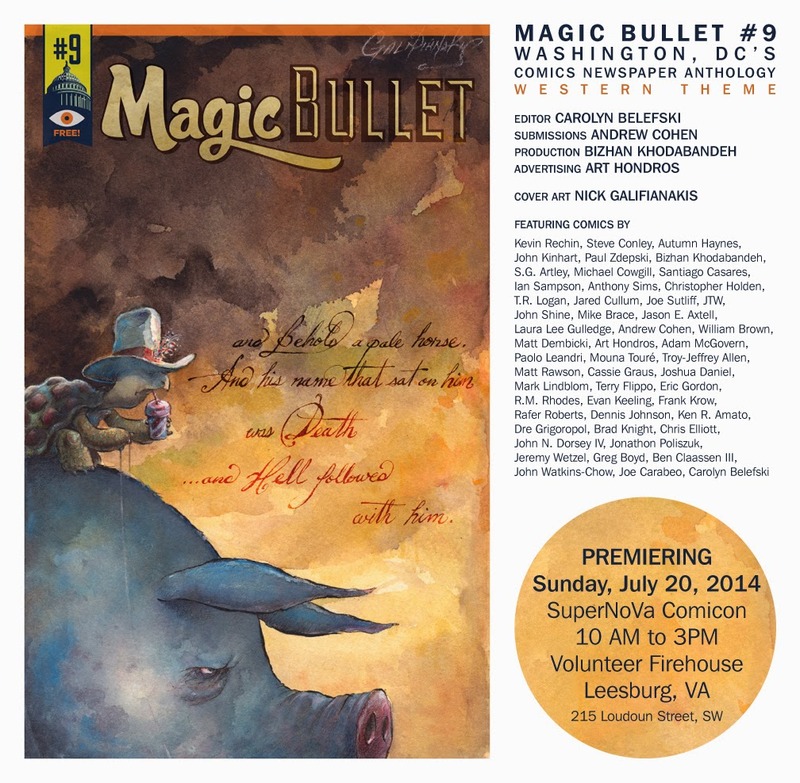 Magic Bullet is Washington, D.C.’s free comics newspaper anthology. This issue is Western themed and has been sent to print with a run of 5,000. It will be premiering hot-off-the-press exclusively this Sunday, July 20, 2014 at SuperNoVa Comicon from 10 AM to 3PM in the Leesburg Firehouse (215 Loudoun Street, SW, Leesburg, VA 20175). After this premiere day, we will begin to distribute the newspaper around town at local restaurants, theaters, books stores, tattoo parlors, saloons, and other hip joints. Thank you to all who submitted and we urge you to submit your comics to be considered in future editions. Magic Bullet contributors will be distributing the newspaper for free at many of their convention appearances in 2014. Everyone is encouraged to take part in the distribution of the newspaper so it reaches far and wide. The newspaper will be available at Baltimore Comic-Con (September 5-7), Small Press Expo (September 13-14), and at New York Comic Con (October 9-12) at Small Press Booth #1162. Stay 'tooned for more information about where to find Magic Bullet #9... the hunt begins this Sunday.